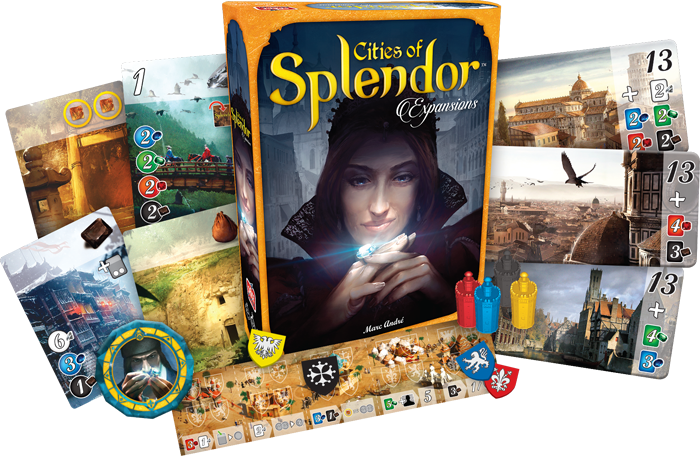 If you’re new to Splendor or the Cities of Splendor expansions, the Cities expansion is the perfect first step for you and your fellow players. While it offers the same levels of strategy and replayability as the other expansions in Cities of Splendor, it has the fewest changes from the core game, making it the easiest expansion to understand and incorporate into your games. The only components used in the Cities expansion are the seven double-sided city tiles—yet these tiles have a profound effect on the course of the game. With this expansion, you’ll no longer use the noble tiles. Instead, you’ll lay out three random city tiles (regardless of the number of players) at the beginning of the game. Winning a good reputation with a single nobleman is easy compared to winning the affections of an entire city, and when playing with the Cities expansion, you can’t win the game by collecting prestige points alone. In fact, you’ll need to meet the extravagant demands of a city—the first player to claim a city wins the game!